The word is out! 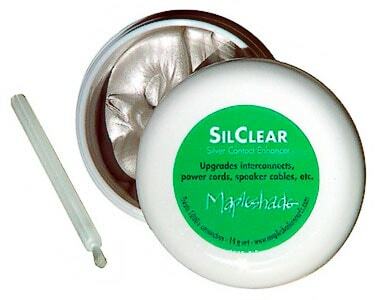 SilClear is the first silver-loaded contact enhancer optimized for superior performance in audio/visual systems. SilClear will significantly improve the sound (or video quality) of any interconnect, power cord, speaker cable, etc. The sonic improvements noted include remarkable increase in treble extension, transparency, detail and sparkle, without any added edginess. Bass sounds tighter, and less boomy. Attacks are noticeably quicker and punchier. Midrange timbres and harmonic details are articulated more clearly, yielding a more natural and intimate musicality. SilClear uses microscopically thin silver platelets (a millionth inch thin; 8 square feet of surface per gram!) to enhance the conductivity of electrical connectors. The unique binder for the silver platelets is an ultra-pure, low dielectric absorption, food-grade grease that minimizes signal loss/smearing. The thinnest possible coating lasts 10 to 20 unpluggings. Comes in a 7-gram jar (with applicator) that treats 1000+ connectors. Arguably one of the best new tweaks on the market.